If you’re going to threaten someone, at least make sure you don’t do it in writing. That’s the lesson that Andrew Johnston, an area sales manager for “deal of the day” website Groupon, learned the hard way after an email exchange between himself and a local San Francisco restaurant was leaked to Facebook by the owner of the establishment. I sincerely appreciate you hanging up on me. As a resident of San Francisco for over 25 years, I have a huge network of friends (ages 25-40) that all are extremely active on Yelp as well as other social media. I will gladly let them know how you treated me as well as my feelings about the people who run Sauce. Instead of cowering at Johnston’s menacing words, Hosley responded with a measured and calm email of himself explaining to him why wasn’t interested in a business relationship with Groupon. You must be new to cold calling, you might want to develop a thicker skin, or work for a less despised company. Despite what you might think, you have NO right to my time. I told you that I was not interested and asked you twice to remove me from you call list, as I have EVERY time I have been called by a representative from Groupon since our last, horrific, experience with your company. I do not have to give you any more chances, you do not have the right to interrupt me, take time away from my already busy day or to force me to listen to how new and wonderful Groupon is, I am not interested. You would be saving yourself time and energy by removing me from your call list, and focusing on business with whom your company has not already burned bridges. We had a relationship with Groupon, Groupon messed it up, we no longer want to have a relationship with Groupon, end of story. After two or three years it would seem like you could respect my wishes as a business owner not to deal with your company and leave me alone. Hosley then proceeded to publicly shame Johnston on Facebook. Since it was first posted on Friday, the post has been shared 47 times and has received more than 100 comments, all of them praising Hosley and lambasting Johnson—and, by extension, Groupon. “Typical of these vampire companies who don’t actually produce anything and then act as if you owe them,” wrote a fellow business owner. Meanwhile, Johnson appears to have stuck to his word, giving out two one-star ratings to two Sauce locations. 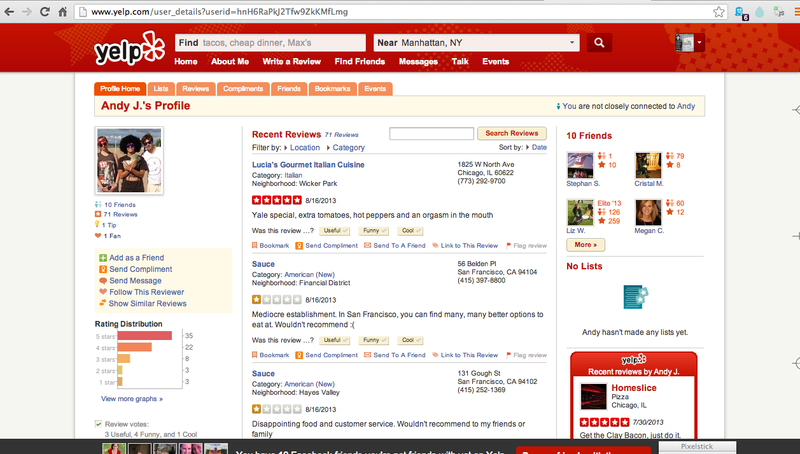 His Yelp page appears to have been deleted, but not before it was screengrabbed for posterity. “Mediocre establishment,” it reads. Thankfully for Sauce, the malicious negative feedback has been counterbalanced with at least three 5-star reviews that specifically mention this incident. As per Groupon, a company spokesperson told AllThingsD that Johnston has been suspended and is facing an investigation. “As you can imagine, such actions are not acceptable to Groupon,” the spokesman said.